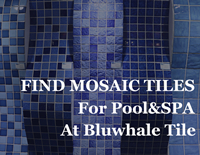 If you are going to plan and design your swimming pool and spa project, Bluwhale Tile would be awesome for you to visit, where you will discover a wide selection of beautiful mosaic tiles to choose from. If you are going to install a swimming pool, ceramic mosaic tile would be on your tile list for your projects. 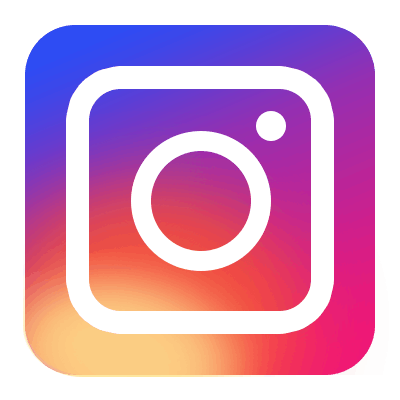 This post you will find why ceramic pool tile popular and widely used. 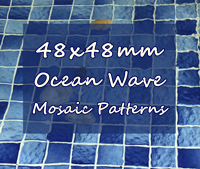 And we are introducing our best-seller 48x48mm ocean wave mosaic pattern ceramic pool tile for you. 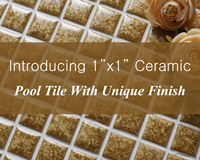 New and unique collection of 1"x1" ceramic pool tile with unique finish to fambe series. Take a closer look these 6 beautiful new designs. High quality, beautiful color and competitive pricing, your old-fashion swimming pool can be turned up striking look! 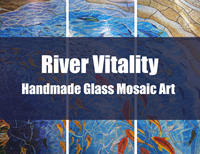 Bluwhale Tile supplies glass mosaic tile wall art design in River Vitality picture, perfectly make a striking look in different spaces. Mosaic murals can be customized as request.